Most diseases start on our plate. Perhaps, more importantly, is what we have eaten that is still with us and has not been eliminated. If our body is toxic, then we are unable to absorb and utilize all of the nutrients that we, in fact, may be eating properly. 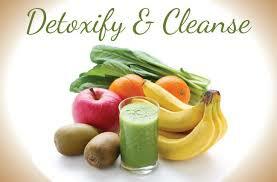 If we don't cleanse, then toxicity builds up, which is a detriment to our overall health and well-being. Not to mention it zaps the energy right out of us. The source of all of our aches and pains begins with what we eat. Toxins are passed onto our liver and our blood, which decreases the oxygen in all of the cells of our body. In addition, we put stress on our bodies by eating certain foods that are toxic such as processed foods, herbicides, pesticides, food colorings and preservatives. Contamination makes the body more susceptible to disease. When our cells continuously become starved for oxygen and our river of life becomes filled with toxins, we are leading ourselves down a path of chronic illness or even death. When the body is clean and strong, it can eliminate waste easily. If you have a heartbeat, yes. If you have been working very hard or have been under a lot of stress, yes. If you eat sugar or white flour and/or drink a lot of caffeine or alcohol, yes. If you feel a cold or flu coming on, yes. If you want to prevent disease and/or rest and rejuvenate the whole body, yes. If you want to assist with weight loss, yes. If you want greater mental clarity, yes. If you need better quality sleep, yes. Signs you could benefit from Internal Cleansing: bad breath, headaches, skin problems, constipation, use of medications or antibiotics, body odor, fatigue, bloating, frequent colds, excess weight, lower backache, cancer treatments. Colon Hydrotherapy is a safe and very effective method to cleanse the colon (large intestines) of accumulated wastes and toxins. It can be a gentle and effective way to a cleaner, healthier and more energetic body! Contact Samsara Detox Therapies in Basalt, CO. at 970.927.2259 to see if you might benefit from Colon Hydrotherapy. Mention Lori Small and receive a free phone consultation.